Music is good for the soul. Every grade school student who did a science experiment that had plants listening to different kinds of music always found that it has a direct effect on growth and development. Most don’t take the experiment through all the way to the specific ways it helps the brain, but here are five specific ways it does. Just think about all the things you do while playing the piano. You are looking at two different lines of music, working both hands differently, and listening to how it all sounds together. Since you know how it sounds, your ears are doubling checking the sounds to make sure everything is in tune. In many songs, at least one pedal is playing and the brain must be thinking about when to lift and when to drop the foot down again, depending on how it sounds to the ear. Does this sound complicated? It is, but piano players can do it all while making it sound smooth and look easy. These skills contribute to a brain that is more well-rounded in all areas. Since piano players are constantly working their hands and feet, they have a greater ability to work them off the instrument as well. Most musicians have greater coordination when moving around. Taking piano lessons can help those who are looking to improve their coordination for any reason, including sports or rehabilitation after an accident. Reading music is similar to reading a book because of the letters and pattern of reading left to right. Both are essentially codes that need to be figured out and done in a specific order. Each one can train the brain for the other part. Individuals who learn to read and play the piano at the same time have an easier time with both. The Psychology of Music journal published a study showed that music improves language and reading skills simultaneously. Music theory, notes, and rhythms are all based on math and counting. Studies among students who play an instrument and those who don’t usually show that musicians perform better on tests. Since counting rhythms and time require math, it makes a lot of sense. Language and music are very similar in that they have different melodies, sounds, and intricacies that require a specific set of skills. Learning to read and interpret music is just like learning another language, and helps prime the brain for learning other languages too. Musicians are also introduced to terms from different languages, especially Italian and French. 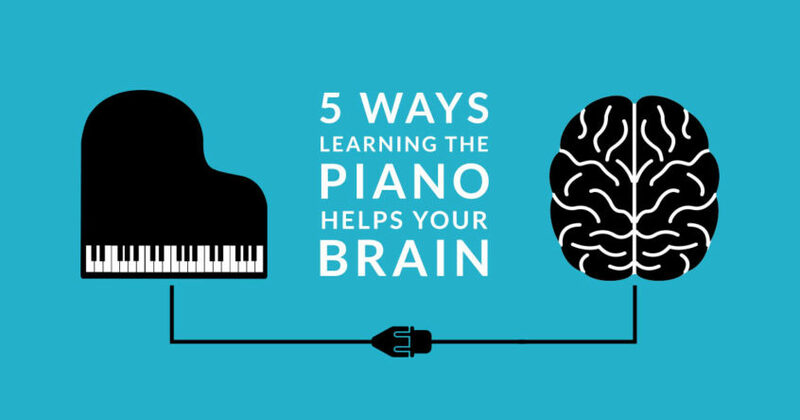 Playing the piano demands so much brain power that it changes the structure. Brain imaging has helped researchers see exactly how it changes. These scans show that when jazz pianists play, the connections between the varying parts of the frontal lobe are more efficient than those of a non-musician. It also showed in other scans that playing piano can make connections between the two hemispheres. All of this research shows that the ability to integrate information is easier for musicians and it improves the decision-making process. I am 61 and really want to learn how to both play by ear and read music. I like your site, it has a lot of great information, but being new to music, where do you really start and what is the best way to use your site. I have learned all 12 scales. I understand transposing chords, need more practice. Hey Jorge! Go to the curriculum page https://www.pianochops.com/lessons/curriculum/ and see if that sparks any ideas. You can always message us from the “contact” page and tell us more about your goals and we will get you going in the right direction. I am using the site to teach my grandson piano. He plays by ear and finds it very difficult to read notes. So we are doing the pianochops together. He is 13 and I am 65. I’m 63 years old and just purchased an electric piano about a year ago. I have aspirations of playing in church and writing music but I still work 5 days a week so my practice and playing time is precious for me. I’m trying to learn and remember all 12 keys with there chords in all 3 inversions but it’s a struggle to say the least. I realize I need help through lessons. I’ve watched and enjoyed your YouTube videos. I am considering joining your website but I only have an iPad with limited access to programs needed to join. Can I still benefit from your site or should I wait until I’m able to access a computer? Also for the time being do you have any practice advice for me ? I use an iPad exclusively on PianoChops.com and It works very well for me.